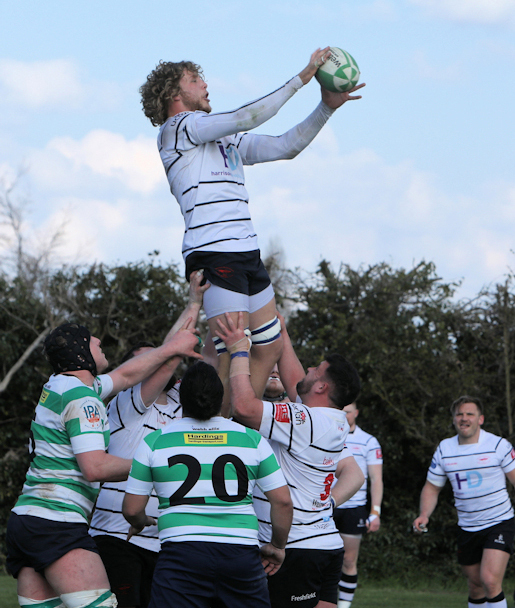 Hoppers travelled to Welford Road for their last away fixture of the season against South Leicester RFC who were facing relegation from National League 2 North. Having beaten this team to ‘nil’ at Lightfoot Green, their supporters were hoping for a confident performance from their team and whilst they were treated to an entertaining match, this proved to be no pushover for the Preston side. Arnie had had to make some changes through injury and players’ unavailability so with PJ Millea and Adam Howard on the bench, and the front row totally changed from that which had played them into seventh spot in the league, Ally Murray lead the team out and Hoppers kicked off in bright Springtime sunshine with a bitingly cold stiff breeze blowing the length of the pitch. South Leicester collected the ball and a series of fast passing moves had them inside the Hoppers’ 22 and their visitors found themselves behind within three minutes after conceding what was the first of a glut of penalties in this match. Hoppers restarted and the pattern for the day was established as the backs began to penetrate the Leicester lines. Breaks from Scott Jordan, playing at scrum half today, and Will Davidson at centre pressurised the home defence which was finally breached when Alex Hurst left all behind him as he blazed through the opposition to score the first of his three tries. Tom Davidson made short work of the extras and order was quickly restored. South Leicester replied with a penalty of their own to make the score 6 – 7 and play settled down into an evenly-matched contest for possession which was only lost through missed passes, interceptions and knock-ons. Hoppers’ forwards were playing well but both defences were under attack in turn and play moved back and forth until another break by Hurst from the South Leicester 10m line had him across the line and with Davidson accurate again, the lead was extended to fifteen points. A converted try of their own put the home side back in the game only to see their opponents extend their lead with a penalty by Davidson from the 22 directly in front of the posts followed by another try, this time from Luke Procter, which gave Hoppers the bonus point and made the half time score 13 – 29. Whist Hoppers had been in control for the most part, South Leicester had not allowed them to dominate the scrums and had shown themselves to be dangerous on the break with fast pace and deft handling of the ball. The Hoppers’ backs had shown their abilities, running the ball at every opportunity and making significant breaks into the opposition’s territory, whilst their forwards had battled their way through the defence time and again despite their hosts’ sharp distribution of the ball from set pieces. After a half-time talk which focussed on maintaining possession and playing simple rugby, Hoppers lined up for the second half and continued the entertainment with Scott Jordan getting into the act with his first try within two minutes of the start. Davidson added the two points and the score moved on to 13 – 36. Hoppers were then under attack and spent almost fifteen minutes penned inside their own 22. Penalties came thick and fast and when Ryan Purcell was shown a yellow card the home side took the advantage and number twelve, Pohe, scored under the posts. Glasse converted and again South Leicester put themselves back in the game. The restart went out on the full and from the scrum Hoppers were defending deep inside their own half until another break from his own 10m line saw Hurst tear through the opposition to score his hat-trick try. The conversion attempt from inside the touch line missed but despite being a man down, Hoppers’ lead moved on and the score stood at 20 – 41. However, once again the home side set about their business and were camped on the Hoppers’ 5m line pressing the defence through a prolonged sequence of phases. Things did not improve for Hoppers as no sooner had Purcell been restored to the game, Jordan was yellow carded for not rolling away and they were down to fourteen again. South Leicester continued their assault on the Hoppers’ line and a succession of penalties against the visitors tried the referee’s patience who decided to award a penalty try much to the elation of the home faithful. Once again, fourteen-man Hoppers managed to add to their score with a penalty by Davidson in front of the posts but ten minutes later the Leicester side replied with a converted bonus point try of their own. With less than three minutes of the match remaining, Jordan, now restored to the field, sealed the victory with his second try and with Davidson taking his tally of points for the afternoon to sixteen, the conversion was the last play of the match. The final score was 34 – 51, a satisfying result for the Hoppers’ supporters considering their team had played for a quarter of the match with fourteen men and had still achieved an impressive total. ‘I’m really happy with the five points. Playing a side facing relegation is always dangerous and South Leicester are not a bad outfit. This was not a perfect performance by any means but we did what we had to do. The backs had a very good day today with impressive performances from Nathan Pope and Will Davidson and my Man of the Match, Alex Hurst who has shown his ability each time he has played and has now capped that off with a well-deserved hat-trick. With Easter giving the team a break next week, the final encounter looks set to be a great match. Hoppers had the better of Chester for most of the game in the first match of the season and with their visitors looking to the play-offs for promotion an entertaining afternoon could be on the cards.